The print is only marked as Rudolf Freund, but a label on the back calls this Cardinal on Mockorange by Rudolph Freund. It is marked as 8 x 7 inches, and this could be true, however, the visible print 4 1/2 x 3 1/2 inches. 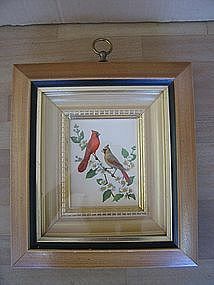 The wooden frame measures 10 x 9 inches. There is no date on the print or frame, but the paper and the style of print on the back shows age. The print is simply beautiful and the frame is just outstanding. Normally, I never buy anything that has that shiny new gold look, because I like my frames to have a dullish patina. Considering the obvious age of the paper, I wondered how the metallic finish has stayed so bright, but finally figured out that the glass has protected the finish. The frame, is made like a shadow box, with the print and the inner frame covered by the glass. The shadow box look is emphasized by having like a "bay window" on the back which holds the inner frame and print. It sounds confusing the way I am describing it, so it would be better to request additional photos. It was manufacturing by Turner Mfg. Co., sometimes called Turner Wall Accessories. There is a brass ring to hang with, but there is also a wire hanger on the back, There are some superficial scratches. I have additional photos by email. I have another Rudolf Freund print in the same frame available. I need your zip code to calculate the postage.